Situated in a safe, family friendly neighbourhood which is fully fenced. Only a 10 minute stroll into town and a 5 minute walk to Taupo's main swimming beach on Lake Terrace. Three bedrooms and 3 bathrooms, our holiday home offers plenty of room for the whole family. 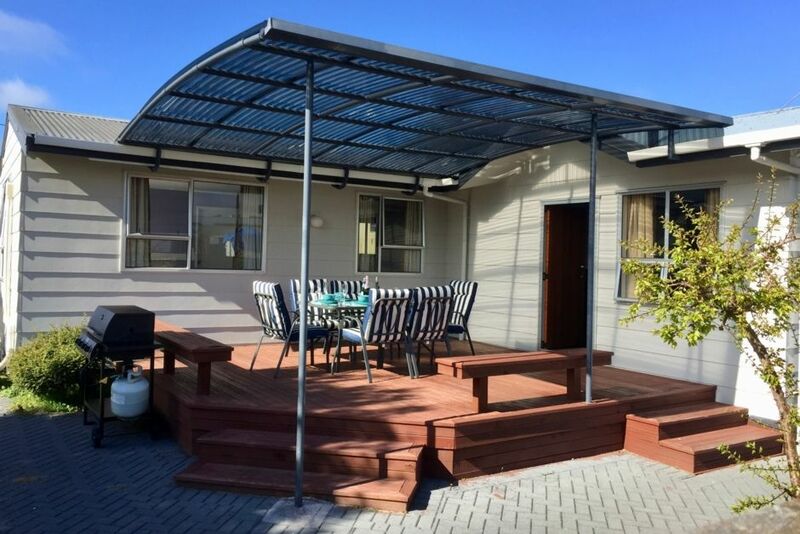 Open plan living adjoins sunny deck with built-in seating and archgola covering - great for alfresco dining. The kitchen has a twin gas hob and dishwasher, lots of bench space, with separate scullery and loads of storage. The close proximity to a small block of shops makes it easy to pick up any last minute items. Walk along the Lake front on your way into town to visit one of the many cafes for a late breakfast. In the evening you can leave your car at the house and walk into town for a delicious dinner or to visit one of the bars. Garage available to store bikes and gear. We love animals! We're happy for you to bring your pooch as the property is secure, however prior notice is required. We do ask that dogs remain outside at all times. We also ask that you remove all dog poop from the property. This is a residential area and we trust that you will consider and respect our neighbours. Room to park your boat or jetski. Small fenced in lawn area in front of the house. The neighbour (at the rear of section 5) was far from animal friendly, which made the experience a bit uncomfortable House was reasonably tidy. Thank you for allowing us to stay at your place. Nice and clean house, bigger than it looks in pictures. The house was bigger than I thought it was going to be. One bedroom and bathroom on the other side of the house was great for my parents. Garage was perfect to store our trailer, kayak and bikes. We enjoyed our stay at this bach over Christmas 2018. There was plenty of room for both couples to have almost separate ends of the house! Three full bathrooms was fantastic with a central kitchen and dining area. A larger or second fridge would be a great addition for this bach as we did struggle to store all of our supplies over the holiday period, and resorted to storing extra provisions in chilly bins we had bought with us. Overall a great place to stay! Excellent location, within walking distance of Lake and town. Ideal for our family gathering of 6 adults and two babies. Was amazing to have three bathrooms. The decor was lovely and the large covered deck great . Kim was helpful and pleasant to deal with . Would definitely stay again.